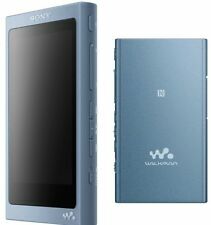 Sony NWA45B 16GB Walkman Digital Music Player (Moonlight Blue). High-resolution portable digital music player with Bluetooth and FM tuner. plays MP3, FLAC, Apple Lossless, AAC, APE, WAV, and WMA audio files (up to 24-bit/192kHz). Looking for an alternative to the Apple equivalent?. Although it shows its use with minor scratches and blemishes, this little 16 gig Sony is actually pretty cool, easy to use, and works without issue. Sony NWA45B 16GB Walkman Digital Music Player (Greyish Black). High-resolution portable digital music player with Bluetooth and FM tuner. plays MP3, FLAC, Apple Lossless, AAC, APE, WAV, and WMA audio files (up to 24-bit/192kHz). Condition is New. The coolest feature of this player is you can drag songs from iTunes directly over to the open window for this player and it INSTANTLY converts it and will play on this Sony. You can mix and match your traditional MP3 files and iTunes files! Fully tested and works perfect. Syncs, loads, plays music and FM. Bluetooth works. Sony Walkman, new in box, red in color. Q: Are Your Prices Negotiable?. Make: Sony. Stay entertained with this compact MP3 player/FM radio that lets you enjoy music and photos with drag-and-drop ease, plus up to 35 hours of battery life. Minor signs of use (scratches, dents, etc). We want to provide you with the best buying experience possible. we tested and inspected all the item to the best of our ability. However since we have different variety of product. Give us chance to fix the problem. Made for the outdoors, the NW-WS625 Sports Walkman is tough and durable. Perfect for all terrains, it's salt waterproof and dustproof, as well as slim and comfy to wear. Made for the outdoors, the Sports Walkman is tough and durable. If you own a NFC-capable stereo receiver or set of speakers, simply touch the Walkman to the device for instant wireless streaming. Even if you don’t have an NFC-enabled device, the Walkman can be paired with any Bluetooth speaker system or stereo receiver. Japanese language only!! Touch screen, Bluetooth, Fm radio, noise canceling, graphic equalizer voice recorder and more. Imported from Japan. Actual item pictures. You get what you see. Fast shipping with tracking number. No accessories included. Player only. Thank you. This Sony walkman is in used condition, the language is set to Japanese. I'm not sure how to change it back or if you even can. So if you read Japanese you can get quite a deal on this one! there is a small bubble underneath the screen on the bottom right, but it appears to have a screen protector installed so it could be that (see photo 1). 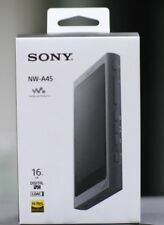 Sony Walkman NWZ-S545 Black ( 16 GB ) Digital Media Player. Condition is Used. Shipped with USPS First Class Package. You can enjoy photos, album artwork and videos on the brilliant 2.0" LCD display or even sing along to your favorite songs as karaoke mode scrolls the lyrics to the latest hits across screen. The Walkman provides drag-and-drop file transfers for easy uploading of your music, pictures and video. Open Box Sony Walkman NW-E395 16 GB Flash MP3 Player - Red - Photo Viewer, FM Tuner - 1.8" - Battery Built-in - MP3, MP3 VBR, WMA, ASF, WAV, AAC, AAC-LC - 35 Hour. Enjoy your favorite music and radio stations with the Sony Walkman. Sony Walkman A 16gb Nw-a35 L Bluetooth Microsd Hi-res Viridian Blue Japan New. Condition is New. Shipped with USPS Priority Mail. Sony 16GB Walkman. Take your music with you or listen to the built-in FM radio on this Sony Walkman MP3 player. recharging this Sony Walkman MP3 player. Enjoy up to 35 hours of audio before. Include WMA, AAC, MP3 and more audio formats so you can enjoy your music collection. This Sony Player Is in like new condition and all functions work perfect. Stay entertained with this compact MP3 player/FM radio that lets you enjoy music and photos with drag-and-drop ease, plus up to 35 hours of battery life. Carriers are required to wait while an inspection takes place. Sony Walkman NWZ-WH505 Headphones/ MP3/ speakers 16G 40mm Driver Unit Silver. 16 GB (4,000 Songs). • Sony NWZ-WH505 MP3 Player. Wireless Music Player: Music All The Way. • The NWZ-WH505 does more than most headphones. About the item: This item is associated with the following MPN(s): NWZ-E475/BM. Battery Life Details: MP3 playback - lithium ion - up to 36 hour(s) Video playback - lithium ion - up to 6 hour(s) FM radio - lithium ion - up to 12 hour(s) Voice recording - lithium ion - up to 3 hour(s). SONY Walkman S series 16G PINK NW-S15 Bluetooth. with Japanese language only. Noise Canceling. DISNEY EDITION. Player only NO ACCESSORIES INCLUDED. And much more amazing features. Play Seed 0.5X : 2.0X. Factory reset. Sony Walkman Hi-Res NWA35B 16GB High-Resolution USB MP3 Player, Skullcandy Smokin’ Buds 2 Black/Red and chargers (I did throw away gummy inear piece). Condition is Used. Apple EarPods Condition New. Shipped with USPS Priority Mail. You will receive both devices pictured. The red one has about 1600 songs on it. The black one has been reset and doesn't have anything on it. They both turn on and seem to function fine. There is a small scratch on the top right hand corner of the black mp3 player. Condition is New. NEVER BEEN OPENED. FM Radio and built in speakers! Includes - Charging Cable OEM Sony Earbuds. There is heavy wear and tear present on this item. Obvious signs of heavy prior use, such as extensive scuffing and scratches on the item throughout. Will not affect the functionality.